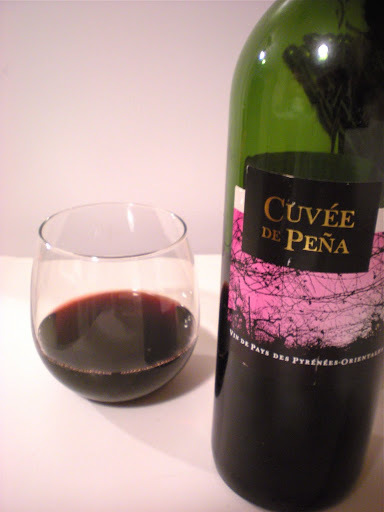 I picked up the Cuvée de Peña Vin de Pays des Pyrénées-Orientales for two reasons; the first being that the purpley landscape on the label was very gothy/Tim Burtonesquey, and second that it was a French wine with a Spanish sounding name. As I put it into my shopping basket, I questioned just how sensible those two reasons were. Once it hit the glass I immediately noticed how thin it was, the wine was a decent enough garnet-maroon, but near the edges of the curve of the glass it was nearly transparent and brownish in colour. First up was the smell and taste of raspberries, which I’m always a fan of. There was a little bit of spice following, and then the harshness kicked in. And by harshness I mean an alcoholey bitterness. It tried really hard to have a tobacco finish, but this became overpowered by the alcohol taste. I am a trooper though, and my polenta with portabello mushrooms and ricotta really helped out in erasing some of the alcohol vibe.I understand that the wine was only $9, but knowing that there is quite the plethora of really yummy $10 bottles out there, I was disappointed and would not be purchasing it in the future.